– Get 25% DISCOUNT on the Best Available Rate Room only. – Check in timing: 3:00pm till 12:00 midnight. – Offer is valid for single or double occupancy. – Offer is applicable for all room types and subject to availability. – Complimentary access to the swimming pool, sauna, jacuzzi and fitness center. – Offer is valid during weekdays (Sundays, Mondays, Tuesdays & Wednesdays). – Get 10% DISCOUNT the Best Available Rate with Buffet Breakfast. – Offer is valid for single occupancy and minimum stay for 2 nights. 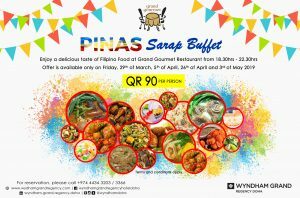 – 30% discount on Food & Beverage. 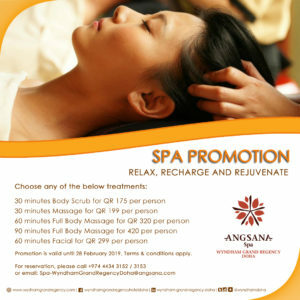 – 30% discount on Angsana Spa. – 30% discount on Laundry service. – Offer is valid during weekends (Thursdays. Fridays & Saturdays). * All week access to Fitness Center. * All week access to swimming pool, steam and sauna facilities. * 20% Discount off Spa Services and Packages. * 20% Discount off selected Angsana Gallery products. 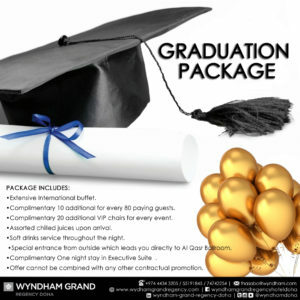 * 10% Discount off Food & Beverage in Wyndham Grand Regency Hotel. 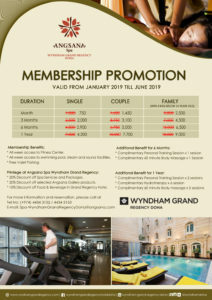 This promotion is valid until 30 June 2019. 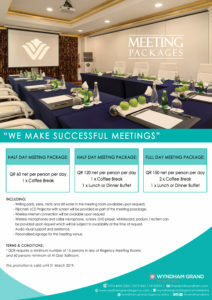 Book your next business meeting, training course or team building workshop at Wyndham Grand Regency Doha Hotel. – Writing pads, pens, mints and still water in the meeting room (available upon request). – Flipchart, LCD Projector with screen will be provided as part of the meeting poackage. – Wireless internet connection will be available upon request. – Wireless microphones and collar microphone, screen, DVD player, whiteboard, podium / lectern can be provided upon request which will be subject to availability at the time of request. – Audio visual support and assistance. – Personalized signage for the meeting venue. – DDR requires a minimum number of 15 persons in any of Regency Meeting Rooms and 60 persons minimum at Al Qasr Ballroom. 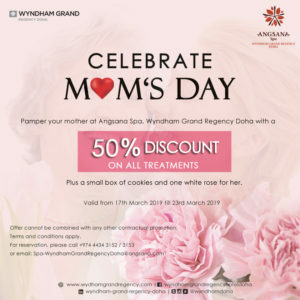 – This promotion is valid until 31 March 2019. – Offer cannot be combined with any other contractual promotion. – Complimentary 10 additional for every 80 paying guests. – Complimentary 20 additional VIP chairs for every event. – Assorted chilled juices upon arrival. – Soft drinks service throughout the night. – Special entrance from outside which leads you directly to Al Qasr Ballroom. 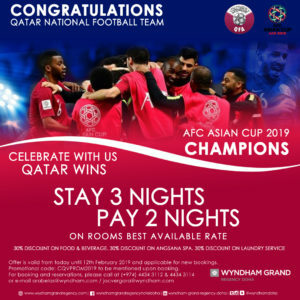 – Complimentary One night stay in Executive Suite . 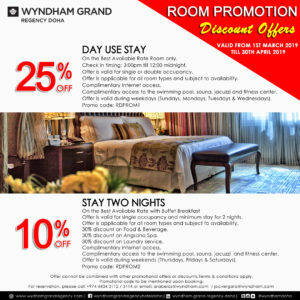 This promotion is valid until 31 March 2019. 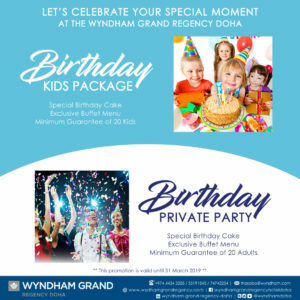 Let’s celebrate your special moment at the Wyndham Grand Regency Doha.